The next year was spent, with only two other foreign students among several hundred Russians, at the School for Terror and Diversion at Kuchino, outside Moscow. Here Grant went triumphantly through courses in judo, boxing, athletics, photography and radio under the general supervision of the famous Colonel Arkady Fotoyev, father of the modern Soviet spy, and completed his small-arms instruction at the hands of Lieutenant-Colonel Nikolai Godlovsky, the Soviet Rifle Champion. I had first wanted to know if there was a Colonel Arkady Fotoyev. I finally found a reference to him in an Associated Press story from April 23rd, 1954. The headline: U.S. Accuses Russia Of Uncivilised Act In Ordering Murder. It is a story about Nikolai Khokhlov, a former KGB officer who had defected to the United States the year prior after refusing to carry out a political assassination. First we lose Gouzenko and the whole of the Canadian apparat and the scientist Fuchs, then the American apparat is cleaned up, then we lose men like Tokaev, then comes the scandalous Khoklov affair which did great damage to our country, then Petrov and his wife in Australia–a bungled business if ever there was one! And finally when they’ve decided that Bond will be the target. SMERSH has made one or two mistakes lately. That Khoklov business for one. Remember the explosive cigarette case and all that? Gave the job to the wrong man. Should have given it to me. I wouldn’t have gone over to the Yanks. And then when gloating to Bond about how much shame and embarrassment this scandal will bring to the West and specifically the British Secret Service. Talk of the Khoklov case! This will knock spots off it. The murder-sabotage outfit to which he belonged is known as the “Ninth Section (of the MVD secret police) for Terror and Diversion’ – “Devyaty Odtel po Terroru I Diversii” in Russian. Its headquarters are in Moscow’s notorious Lubianka prison and Col. L. A. Studnikov commands it. Training is carried out at a base on the corner of Metrostroyevskaya UI. And Turnaninski Pereulok, in Moscow, under Col. Arkady Fotoyev and staff of experts in small arms, judo, code radio, driving, shadowing of victims and photography. Terror and Diversion, and it is carried out by Col. Arkady Fotoyev. Kuchino is also referenced. Fleming mentions “judo, boxing, athletics, photography and radio” while the AP article says “small arms, judo, code radio, driving, shadowing of victims and photography.” Very similar wording, indeed. After Stalin’s death, there was a lull in activities. Confusion, purges and arrests followed the fall of MVD chief Lavrenty P. Beria. 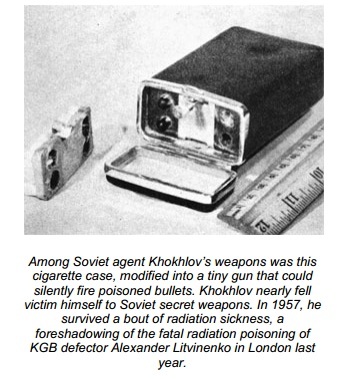 American agents said the weapons turned over to them by the Soviet captain looked like innocent trinkets. Actually they would be deadly efficient tools for an assassin. Two leather-type cigarette cases concealed a mechanism to shoot pellets loaded with potassium cyanide poison. Thumb pressure fired the weapons. They could kill instantly. Two miniature pistols were fired electronically with a discharge no louder than a snap of the fingers. The bullets would shatter on impact, spreading deadly poison through the wound. The electronic mechanism on the cigarette case is very similar to the description we get of the bullet-firing edition of War and Peace that Grant is carrying. Once again, these stories which are nearly 60 years old at this point show just how current Fleming was with the times he lived in, inserting events that his readers would know about right into the plots of the novels. It’s fun to go back in and find these references and learn about them.